The ACL is a strong rope like structure located in the center of the knee. It crosses from the back of your femur (thighbone) and runs down to the front of your tibia (shinbone). The function of the ACL is to provide stability to the knee. ACL injuries are one of the most common ligament injuries that occur. Once the ACL is torn it has a poor ability to heal and typically will not heal if untreated. A sensation of something tearing inside the knee. A feeling as if the knee has momentarily ‘come out of its joint’. During sport when a patient attempts a ‘sidestep’ or ‘twist’ manoeuvre. Often, an ACL Injury can be identified during a physical exam by a medical professional. By manipulating the knee and leg bones the cause of symptoms can be pinpointed. X-rays do not show cartilage and ligaments. They can help rule out other problems with the knee that may have similar symptoms like fractures (broken bone) . MRI can create detailed images of both hard and soft tissues within your knee. An MRI can produce cross-sectional images of internal structures required if the diagnosis is unclear or if other soft tissue injuries are suspected such meniscal or articular cartilage injuries. While not all of these tests are required to confirm the diagnosis, this diagnostic process will also allow Dr Biggs to review any possible risks or existing conditions that could interfere with the surgery or its outcome. When this ligament tears, unfortunately it doesn't heal and often leads to a feeling of instability in the knee. These recurrences must be avoided as these episodes cause further problems like cartilage tears and premature wear and tear resulting in arthritis of the knee. Where a patient is considering giving up sport to avoid an ACL Reconstruction operation, a physiotherapy programme may provide sufficient stability for daily living. It is generally agreed that active patients unwilling to cease sporting activities have little choice but to consider surgical reconstruction. An ACL Reconstruction is the best chance to stabilize the knee and continue a sport or recreational activity. 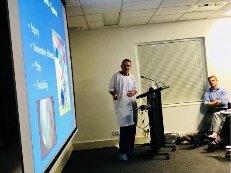 Dr Biggs recently gave a live surgical demonstration of the TLS Short Graft ACL technique to a large group of GP’s and physiotherapists. The short graft ACL reconstruction technique used by Dr Biggs has been developed over the last 10 years in Europe. There have been more than 40,000 operations of its kind across the globe. 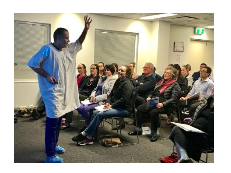 Dr Biggs is one of the first people in Australia to adopt this innovative technique for anterior cruciate ligament (ACL) reconstructions. In traditional ACL reconstructions, two Hamstring tendons are harvested and used to create a long, slim graft that is secured in place in large bone tunnels, by either a direct screw into the graft or by a suspension device that sits on the outside of the bone. The graft diameter obtained is often less than 8mm. With this new short graft Tape Locking Screw (TLS7®) technique, only 1 Hamstring tendon is taken (in 90% of cases). The instrumentation of this novel ACL system allows the surgeon to make a shorter, much larger diameter graft averaging 9mm, using only 1 tendon. The larger graft diameter has been shown to reduce the incidence of re-injuring the knee in the future; and the superior TLS graft fixation allows for early walking and an accelerated rehabilitation. 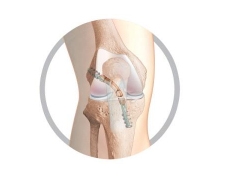 Overall, the TLS® system represents a safe and effective technique for ACL reconstruction with a multitude of advantages over the traditional method. Your own tendon "autograft" is taken from the knee and transplanted to replace the torn ACL. Hamstring tendon (from the inner side of your knee) or patellar tendon (from the front of your knee) are the most commonly used autografts. Autograft ACL reconstruction is indicated in the young active population. If the diameter of the graft is <7mm we know that the re-rupture rate is higher. In that case the graft can be increased in size and strength by adding a synthetic (Lars) ligament or allograft) (donated frozen tendon). This decision is often only made at the time of surgery. Autograft hybrid graft is suitable for all ages. This graft is ideally suited for patients > 40 years whose sporting aspirations are moderate. No tendon is taken from your knee so the recovery is much quicker. A synthetic (Lars) ligament is used to reinforce the allograft tendon. This is indicated when the surgery is performed within 3 weeks of injury and when there is a viable tendon stump. The ACL is repaired rather than replaced. Pre-operative MRI scan gives a good indication whether this procedure can be performed. The final decision is made at the time of surgery. This procedure is suitable for patients >30 years of age who require rapid rehabilitation. No tendon is taken from your knee so the recovery is much quicker. Recovery time is 8-12 weeks. For out of town patients an appointment with a local doctor or physiotherapist 7 – 10 days post surgery for a wound check and the removal of sutures. An appointment with Dr Biggs should be made at least 6 weeks post surgery, with an X-Ray of your knee.